Philadelphia is America’s poorest large city and “boasts” the lowest minimum wage allowed by federal law. Sitting on the bus, waiting for the subway, walking through the city, everywhere we go, workers are talking about how $7.25 is not enough. Leading the way, 15 Now and SEIU’s Fight for $15 are building a movement of low-wage workers fighting for a better quality of life. In September, we marched down Broad Street with hundreds of people, and 11 of us were arrested for civil disobedience outside a Center City McDonald’s. Since then, fast-food workers and 15 Now activists have been meeting to discuss tactics and strategy. Fast-food workers, union and nonunion health care workers, restaurant workers, and unemployed activists are planning the next several months of low-wage worker actions. 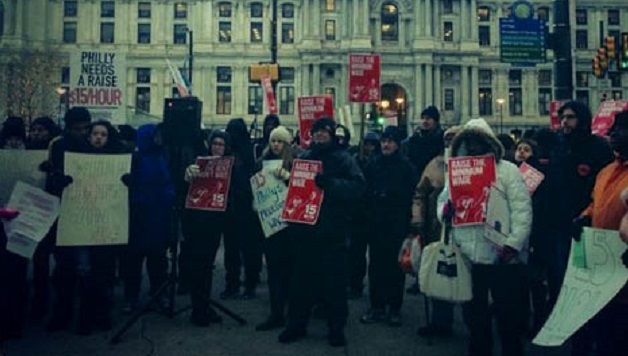 On November 22, our new Low Wage Organizing Committee will rally outside City Hall to announce a Philadelphia Low Wage Worker Bill of Rights and a plan to win a $15 minimum wage and more gains in 2015. Until now, the Chamber of Commerce has effectively prevented reforms, with hundreds of thousands of dollars spent on lobbying City Council and the state legislature. They passed a statewide preemption law in an attempt to ban raising the minimum wage on a municipal level. In 2015, we will challenge those corporate interests head-on and push the City Council and Mayor Michael Nutter to raise the minimum wage to $15 an hour.